Metallica played their previously reported gig in Antartica last Sunday (December 8), but in case you didn't pack a suitcase full of long johns to go catch the band in the cold, you can now watch the entire sub-zero temperature performance from the comfort of home. Following a brief intro from the Colombian branch of Coca-Cola Zero, we're treated to the sight of a group of fans gathered 'neath a geodesic dome and in front of Metallica, letting the riffery of "Creeping Death," "Sad But True" and more warm them deep down to the core. No "Trapped Under Ice," mind you, but maybe Metallica thought that'd be too on the nose for the show. 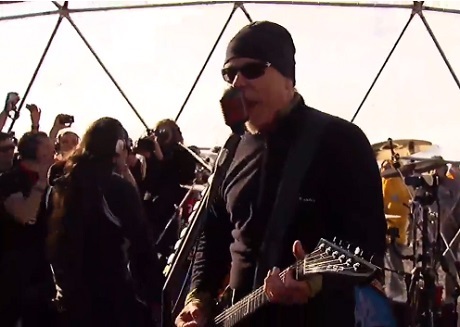 Wanna see James Hetfield rock it out in a weather appropriate toque-and-thermals combo? Then give the concert a look via the video player down below.